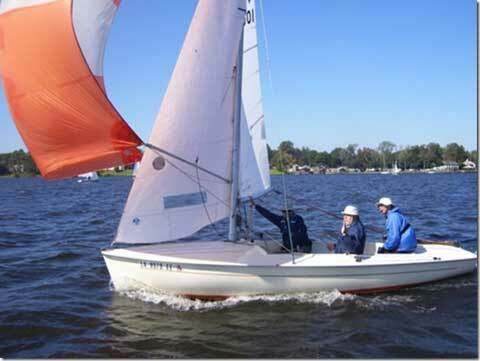 For Flying Scot #4001 race ready with many sails and heavy duty galvanized trailer I want $4,499. Hundreds of times I've raced Flying Scots. Occasionally I've won. Also I've cruised in my Scot. My longest cruise in FS 4001 was from Pass Christian to Ship Island where we tent camped on the beach. The last leg was about 25 miles under spinnaker. Beautiful weather made it a most memorable trip! The Flying Scot has a strong one-design, nation-wide class association, the Flying Scot Sailing Association. It's especially strong on the Gulf Coast. The FSSA has 2 active fleets in southwest Louisiana: Fleet 84 in Lake Charles and 153 at Lake Arthur. There are Scot fleets on Galveston Bay, Lake Pontchartrain, and the Gulf Coast of Mississippi, Alabama, and Florida. The Flying Scot is a family racing sailboat which readily planes. How exhilarating! Also a Scot is suitable for short cruises. I have cruised #4001 it to the barrier islands off the Mississippi, Alabama and Florida coasts. I've sailed it from Lake Arthur to Cypremort Point. That's more cruising than accomplished by many boats weighted down with heavy ballast and accommodations. It's solid and clean. Overall it's the best boat I've ever owned. I've owned Sunfish, a Laser, Lido 14s, Day Sailers, an O'Day 20, a San Juan 21, and a J 22. The last is the best sailing boat I've ever owned but it is too heavy for me and does not plane for anybody. I'm getting a new Flying Scot because I have the envie and my wife said yes. FS 4001 has a galvanized trailer and several suits of sails. The newest main and jib I bought from Mad Sails, Madison, Wisconsin, 2 years ago. I like them a lot; my new Scot also has Mad Sails. FS 4001 also has sails from Ulman, North, and Schurr. It's about 10 miles south of Jennings, LA, which is on Interstate 10 and between Lake Charles and Lafayette, LA. SOLD, sold for price asked within 24 hours.